It’s that time of year again! Comic-Con International: San Diego (SDCC) has come and gone and with it Magic players had the chance of purchasing the Axe Pack of SDCC planeswalkers that are an exclusive of the 2014 SDCC. If you were able to attend in person and buy the set for the retail price of $110.99, or even buying at double markup, then you made out like a bandit. This planeswalker set is currently being sold anywhere from $350 to $475 on eBay and $450 (with axe) on Starcitygames. Even the axe is being sold individually for $65 on eBay. The difference this year is that we now have six planeswalkers in the set rather than five. 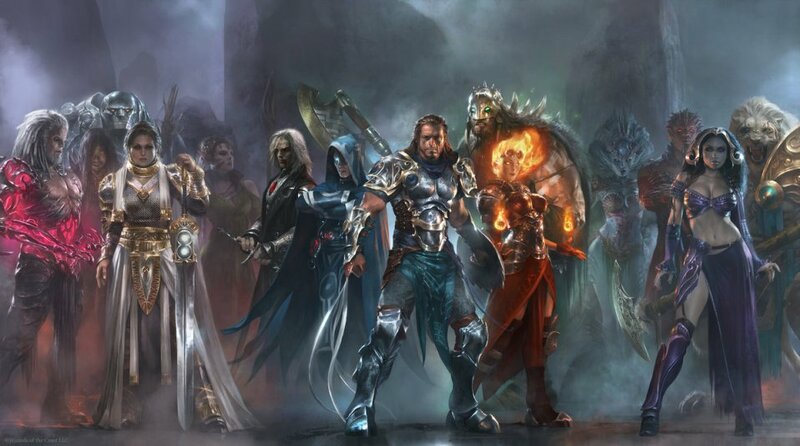 Since the core set this year had six planeswalkers, the promos had to mirror this setup in order to coincide with the walkers in the core set. The art also looks exactly the same as last year’s SDCC set. A black background is outlined in the planeswalker’s respective color in order to add a more dramatic effect to the card. If you’re interested in picking up either the whole set of SDCC planeswalkers or an individual one, I think it would be best to take a look at the past SDCC planeswalker prices to determine if it is better to purchase them as a whole set or to buy them on an individual basis. Since the previous set has been in the market for a year, I want to see if purchasing the original set as a bundle or as individual planeswalkers was better. Based on sold ebay listings, if you shop savvy you could have yourself the first run of SDCC planeswalkers for around $500 to $520. Several of the sold listings have gone over $600, so being able to get one close to $500 is a great price but realistically expect to pay anywhere from $550 to $600 for a sealed box of the original planeswalkers. If we turn back the clock to SDCC 2013, you could pick up this product on eBay for $475 BIN. I couldn’t find any listings closer to the date of the comic con, however if I recall correctly people were selling them for the first week or so after the event for around $250 per set. A few months later, once people realized how rare the set was, the price doubled and the rest is history. Even more interesting was that Starcitygames was buying the 2013 sealed packs for $500 per set a few months after they came out. Unfortunately they aren’t being nearly as generous this soon after the convention for 2014. They are buying the 2013 set for $450 and the 2014 set for $275. This takes SCG out of the picture as an easy way to sell the 2014 set because you are losing some money selling the pack to their buylist if you managed to pick one up at SDCC. Instead, you should take your time selling the set on eBay or another outlet to try and get the most bang for your buck. There is definitely a premium to buying the cards separately. From the averages, I can tell that players want the SDCC Chandra, Pyromaster the most and Liliana of the Dark Realms the least based on price. I would highly recommend that you buy the SDCC 2013 planeswalkers as a set if you get the chance because it is the cheapest way to pick up all the walkers for your collection if that is your goal. However, many players can’t afford or don’t want the whole set, so if you looking to try and get singles from this set I would recommend that you pick up either Liliana or Garruk. Liliana is the cheapest of the bunch, yet she is still as rare as the rest of the planeswalkers. Her cost of entry is lower than the other Planeswalkers so I believe that she is the planeswalker to get in on if you want to own a piece of the 2013 exclusive set. Her price will only go up along with the rest of the 2013 walkers over time. I’ve heard that this first run was only 5,000 sets – which means that there are less copies of these singles of out there than any other Magic card barring test prints, Alpha / Beta rarities, and other Magic oddities (I’m not sure what the numbers are for media inserts like Mana Crypt, Jace, or Standstill). Wizards has created a way for new players to own a piece of Magic history. Who knows how much these sets or individual cards will be worth in 20+ years if the game is as strong then as it is now. I’m also a believer in Garruk from the 2013 set. He isn’t as expensive as Chandra and I feel that he has the most to gain as the set ages if you can purchase him for $170 to $200. He is my favorite Planeswalker from this set because he is strong in Commander and casual formats, which will be the main driver of the price of these cards. I think the price of the SDCC promo will reflect this as players try to acquire him for Commander decks and cubes. I admit, Chandra is definitely the best planeswalker from this set for cubes – I feel that many of the 2013 Chandras have made it into someone’s cube already. Realistically though, $240 is a lot for a single card out of this set especially since there is a SDCC 2014 version of her. Garruk is much more affordable and just as good without the reprint, so I feel that more players will be looking to pick him up as time goes on which in turn will drive the price up. Again, buying the singles individually over time is going to cost you more than the whole set. Many people are saying that this set is a good deal right now even at $500 because there are six planeswalkers which means there is a higher chance that any of them could break out and become very popular. In other words, as most premium products go the sooner you pick yours up the better. If you’re looking to buy singles out of the 2014 set, I would wait for the prices to settle a bit more before diving in even if that means that one of the Planeswalkers could spike higher than the rest. We don’t yet know which of the Planeswalkers will be the most sought after. At this stage in the game, purchasing singles means you’re gambling on what you think most players will want in the future. I’ve found that many times I’ve been mistaken about this, so I imagine many of you have as well. It especially hurts to be wrong on a product that doesn’t have a low cost of entry. For example, I could argue that 2014 Liliana will be the most expensive in the future because Liliana Vess has a billion printings and still commands a price of $6 for the M15 version. Players seem to love Liliana Vess, and I’m not saying that if she only had one printing she would be the same price as Liliana of the Veil but I’m betting she would still be at least $30. I couldn’t even imagine what the foil price might be. This is all just a hypothetical yet I wanted to point out that anyone could give a valid argument for any of the planeswalkers from SDCC 2014. All told, the SDCC 2014 promos seem to be history repeating itself again. If you want your set, any offer from $375 to $450 seems pretty fair to me depending on how quickly you want to sell them. I would only recommend buying the cards as a set at this point because I don’t know if there were more 2014 sets released than 2013 – 5,000 2013 sets seems pretty low for an extremely popular promotional product that I’m guessing sold out at Hasbro within a week, two weeks tops. If there was a much larger release of the 2014 walkers than some of the singles prices could be much higher than their actual demand, much like a presale price when a new set is released. I’m going to let the hype die down before I decide which planeswalkers are the best. I don’t know much about this new black PW set but I think the new release somehow will cannibalize the previous one. It would make the previous version NOT the only black planeswalker set anymore. I expect the prices of the previous version to drop later on and I am not so sure about whether it is a good investment to buy the new ones. It seems like this gonna be in the yearly cycle.